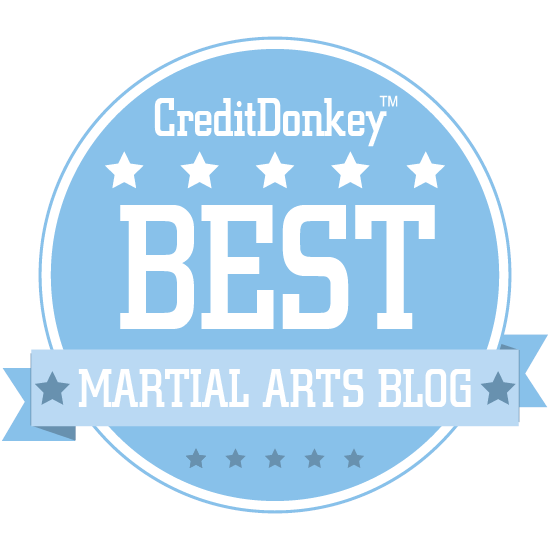 Two recent blog posts have caught my eye - both relating to broadly the same issue, and one that is close to my heart: the difference between combat sports and civilian defence. I have previously described, in some detail, the difference between civilian defence and combat sports (or military combat, for that matter). However both these blog posts offer a different perspective which I find quite enlightening. 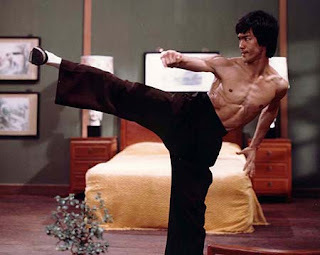 "What I mean by a fighting art is a martial art which is for 'dueling with an opponent and winning'. 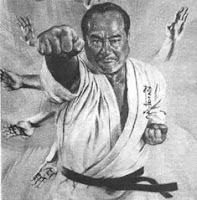 Traditional karate is technically not a martial art which produces fighters, but rather a ‘hit and escape self-defense system’." Andre Bertel in ippon shobu competition action - a particularly nice tokui-renzokuwaza! "Sport methodology is inherently unrealistic because it transforms the asymmetrical goal of pragmatic self-defense into the symmetrical goal of winning the match between two people." What I think both Andre and Phil are saying, is that the dynamics of a civilian defence confrontation (ie. how the fight plays out, what techniques one will use or have to use, what tactics one will have to employ etc.) are fundamentally different from a combat sports confrontation. These stem from both different environmental variables and different goals/objectives. In terms of the latter, it is apposite to note that the primary objective of civilian defence is defence - not attack. Yes, you might counter attack or even pre-empt in defence. But it is still a species of defence. Your main aim is not to get hurt - not to hurt. By contrast, when you fight in a sport, your aim is to hurt - ie. win the bout whether by knockout or points scored by striking your opponent. In civilian defence you win even if you don't hurt your attacker - so long as you (and/or anyone you're protecting) escape unharmed. In practice this often involves hurting the other person. But nothing changes the fundamental point that hurting is not your objective. It is a means to an end. In civilian defence you might well strike, or apply some other technique to, your opponent. But then again, if the opportunity presents, you might just run away. The latter simply does not apply to sports. 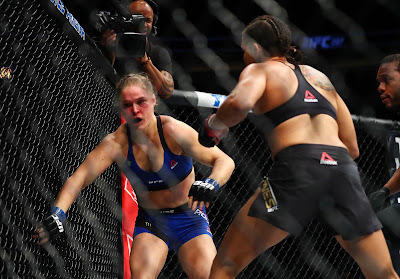 In combat sports, hurting is the objective. I am strongly of the view that this difference translates to how traditional technique is meant to be applied. I see arts like karate as predominantly "counterpunching" - that is to say, you react to a stimulus by deflecting/evading and countering. Sometimes this can be done simultaneously. Sometimes you pre-empt. But in the end, you are not an aggressor. This point might seem to be a subtle distinction, but I believe it is significant nonetheless in determining the dynamics of a particular fight (ie. how it is played out). Both combat sports fighters have to accept some role as an aggressor. In true civilian defence only one side is the aggressor - the other side might use aggression as a regrettable necessity, but he or she is not an "aggressor" in the broader meaning. Having 2 aggressors effects entirely different dynamics from having an aggressor vs. defender. 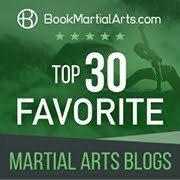 "I guess to understand your argument it would help to know how the techniques and training methods would need to be modified, other than prioritizing training to improve overall athleticism. Here is an example of what I am talking about. Lets say I have a good punch. Well, if I am approached by someone wanting to harm me I put my hands up, tell him I don't want any trouble, and I wait for him to give me an opportunity to knock his block off so I can then do what I need to be it run away, call the police, get my wallet back, whatever. Now, I am in a cage fight. Well, I put my hands up and wait for him to give me an opportunity to knock his block off. If I fail in competition the consequence is a lot less severe than if I fail in SD. However, the same can be said about the dojo. But I have trained the same basic way for each scenario. The difference is my mindset and strategy more than training methods." Say for example you have raised your hands up in a non-confrontational posture in either the cage fight or the street. In a ring fight I would advise against the open-handed kamae. If gloves are used, I would advocate a guard closer to your head. If no gloves are used, I advocate the closed-fisted kamae (like in karate). However this is not what I would advocate for a situation in the street where potential still exists for diffusing the conflict. At this stage, an open handed guard is quite appropriate. So there is difference number one. If the street situation were "beyond repair" - ie. an attack was inevitable, then I would advocate a guard like a karate guard. In this situation the approach would be the same as an ungloved sporting duel. But even here, differences emerge. Supposing you've raised your hands in a defensive posture (in whatever way you happen to do it). What happens next is more interesting. If your attacker backs off in the street, you don't have to chase him or her and continue the confrontation. The issue is over. But what about the sport scenario? If you raise your hands and your opponent stays at a distance - or starts to back away, what do you do? Keep circling? Go back to your corner? At some point one of you will have to "bridge the gap" and enter what I call the melee range. It is not just a question of "walking away". If you walk, you don't win. So the combat sports practitioner will spend a great deal of time learning to "bridge the gap". The civilian defence practitioner will do as Marcel suggested: "wait for him to give me an opportunity to knock his block off so I can then do what I need to be it run away". The science of gap-bridging and other ring dynamics are peculiar to one-on-one duels. They are not designed with the sole aim of defence. They are designed for winning a contest. This means learning how to take the fight to your opponent even when you don't have to for self-preservation. It means learning how to stay engaged even when you might otherwise have been able to walk away. It means learning techniques that are suited to both parties circling each other, looking for openings - because both parties have a competition mindset (and are taking the fight to each other). It also means not learning about other variables: hard asphalt/concrete ground, multiple opponents, weapons, etc. etc. In short, what you might do in competition (go down into a juji gatame) might not be what you'd do in the street (where a juji gatame might just give your opponent's mate(s) a chance to stomp your head). Tactically, your "game plan" is very different. This influences not only the techniques you might choose, but even the techniques themselves. For example, I very much doubt I would ever bother with a kick to my opponent's thigh in civilian defence. Yet this is quite a useful technique in ring fighting. 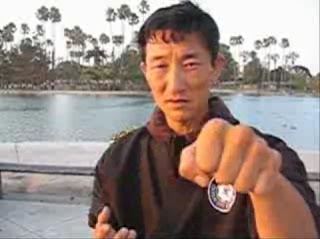 It is a technique suited to "gap-bridging" and "taking the fight to your opponent". It is, I believe, largely unsuited to civilian defence (it being a good tactic for wearing down an opponent over a longer period). Yes, there might be situations where you would use it. But these would be few and far between. There are many more effective ways of neutralising your opponent's incoming attack than a kick to his/her thigh. It is important to note that I don't disregard the potential use of techniques like the thigh kick in civilian defence. It is a question of priorities. In ring sports you don't tend to use certain blows because they are less effective (due to gloves) or illegal - eye strikes or other finger thrusts being one example. In civilian defence the kick to the thigh is arguably going to be useful on occasion, but nothing like in the ring where it plays an important part. 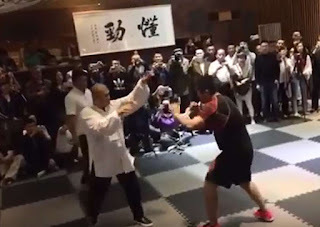 Some of my fellow correspondents on the Traditional Fighting Arts forum have taken me to task about the perceived "passivity" of my approach to civilian defence, arguing that "taking the attack to your opponent" is a very useful skill - in the ring and outside it. Indeed. However the concept I'm not talking about passivity. 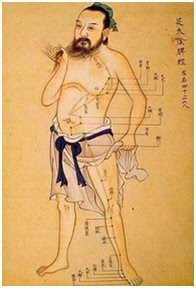 It's about "wu-wei" - not taking any unnecessary action. There is a subtle, but significant, difference. I live by this philosophy. There are instances where "wu-wei" means launching a pre-emptive strike; but this is only where it is a regrettable necessity. I find that most conflict can be dissipated without violence - not escalated. 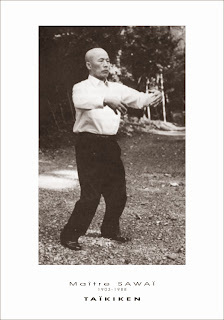 I believe that most traditional eastern martial arts are built on the back of this Daoist philosophy - often misinterpreted as pacifist/quietist, when in fact it is all about lines of least resistance. Sometimes taking the fight to your opponent offers the line of least resistance / most productive outcome in resolving conflict quickly. It is dangerous to imagine however that this is a useful rule of thumb for most cases. I will elaborate on this important philosophical concept (the title of my blog!) in future articles. A good example of civilian defence dynamics - ironically (in the context of this article) executed by a person who is obviously trained in a combat sport - boxing. 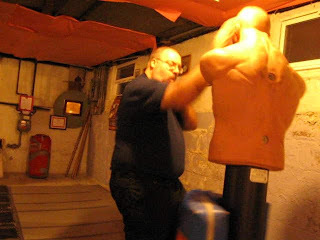 In the above video a man who is obviously trained in boxing successfully defends himself against multiple assailants, using sound civilian defence tactics and excellent technique. Note how the boxer doesn't "take the fight to his opponents" (cf. ring tactics). He is constantly backing away. This tactic alone enables him to narrow the scope of his multiple assailants so that he can deal with them more or less one at a time. Note how he uses environmental factors to assist this. Had he taken the fight to his aggressors he would probably have given them a chance to surround him and overpower him. As it is, he successfully defends himself with honour (and excellent technique). By contrast, taking the fight to the opponent in the ring is often a good rule of thumb. In fact, you can't win by being "passive". Neither can you win by using "wu-wei" (which would question why you are in the ring in the first place). This is my point. 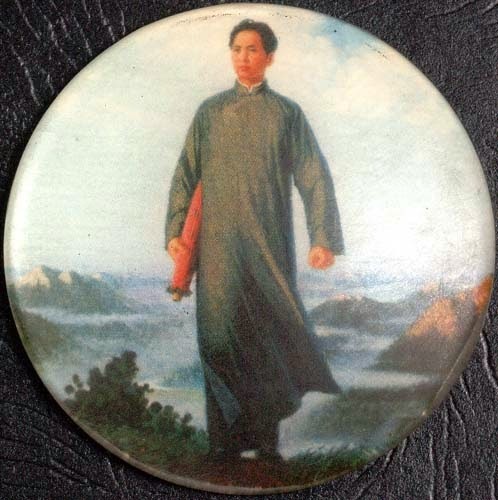 Accordingly I maintain that, on balance, the dynamics of ring fighting require a very different mindset from the "wu wei" approach of civilian defence. In one case you volunteer for conflict, in the other you try to diffuse it or otherwise resolve it with as little violence as possible (ie. what is necessary and no more). We can all exaggerate one perspective over another. In truth, there is room for every ring skill in civilian defence. It is however a matter of weighting. Some ring skills have a lower weighting in civilian defence; in some cases substantially so. It is wrong to say they are inapplicable - it's just that they aren't used as often or in the same circumstances. The dynamics might even be subtle in their difference. But subtle differences can (and, I believe in this case, are) significant nonetheless. I understand your stances on self-defense vs. sport in martial art world and schism this duality causes among masters and practicioners. However, here is the issue. The real question of martial knowledge is not how to obtain it but what to do with it. The use of force has always been quite tempting since it offers shortcuts to solutions. Thus, it may sound strange, but martial sports give your martial skills raison d'être in a way that is socially and legally acceptable. And if that changes the original concept of fighting, then so be it. Thanks Mohammad - I really enjoyed that footage.